Kay Claire Hupp (April 15, 2019) | Burmeister-Johannsen Funeral Home, Inc.
Kay Claire Hupp, the daughter of William and Mary Margaret (Humphrey) Brocker, was born on November 13, 1938, in Omaha, Nebraska. She graduated from Technical High School in 1956, and then married Anthony Tomasella in Omaha; the couple had five children. She later married Ray England, also in Omaha. On March 31, 1989, Kay married Lowell J. Hupp in Harlan, Iowa; it is there they made their home. Kay was employed as the Office Manager at Nishna Bend Conservation Office until her retirement on December 12, 2005. Kay and Lowell enjoyed traveling, and had visited Arizona, Colorado, Georgia, and Las Vegas, Nevada. They especially enjoyed going to Branson, Missouri, to attend various music shows. A good cook and loving mother, she will be deeply missed by her family, as well as her toy poodle and beloved pet of 17 years, Brandie. 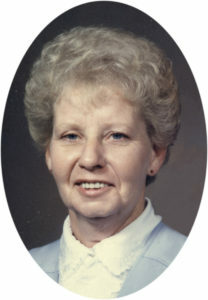 Kay C. Hupp died on Monday, April 15, 2019, at Myrtue Medical Center in Harlan, Iowa. She had reached the age of 80 years, 5 months, and 2 days. Kay was preceded in death by her parents and one granddaughter. She is survived by her husband, Lowell Hupp of Harlan, Iowa; five children; five step-children; one sister, Mary Crosby of Coventry, Vermont; six grandchildren; nine great-grandchildren; and other relatives and friends. Visitation was held on Friday, April 19, 2019, at the Burmeister-Johannsen Funeral Home in Harlan, Iowa. The Burmeister-Johannsen Funeral Home in Harlan, Iowa, was in charge of the arrangements. Condolences may be left online at www.burmeisterjohannsen.com.